You may be aware that data privacy has been much in the news lately. Not only in relation to the mis-use of data gathered via Facebook, but also because on 25 May 2018 new General Data Protection Regulations (GDPR for short) come into force across Europe and by extension across the world. You can read more about GDPR here. If you subscribe to this website to receive notifications of new postings I receive your email address together with the IP address from which you subscribed and the date you confirmed your subscription. This information is used only to notify you of updates to the website. You can choose to unsubscribe at any time after which your details will be deleted. The options are to the right of this post. If you choose to post a comment on the website I will receive your name and IP address, and if you post a link to a personal website that will be publicly accessible together with your name. This website and all details are stored on a secure server. I never sell your details nor share them with anyone without your explicit permission. Thank you for your continuing interest in A Parcel of Ribbons. If anyone was ever in any doubt about the iniquities of the Apprenticeship scheme that followed the apparent abolition of slavery in the British colonies this little book lays out in graphic detail just how much more dreadful things became for those who had been enslaved. I say ‘apparent abolition’ because although no-one was now legally a slave, the apprenticeship scheme left the formerly enslaved suffering the worst of both worlds. They were still tied to their former owners and required to work for them, and they had lost what minimal legal protection they had previously had. 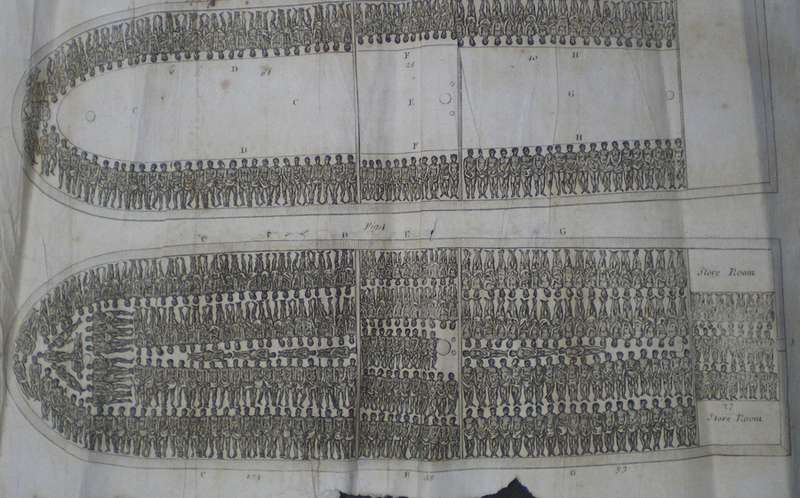 Nowhere was this more clearly illustrated than in the testimony of young James Williams, formerly enslaved at Penshurst in the parish of St Ann. With the connivance of a corrupt local law enforcement, his previous owners, a Mr Senior and his sister, inflicted terrible punishments on young James and many of his fellow former slaves. James was about eighteen when he gave his testimony in 1837 and his resilient character shines through it. When first published in Great Britain it caused an outcry and helped in the final abolition of slavery in all its forms throughout the British colonies. In case any should doubt his account, it was backed up by testimony recorded by a formal Commission of Enquiry. 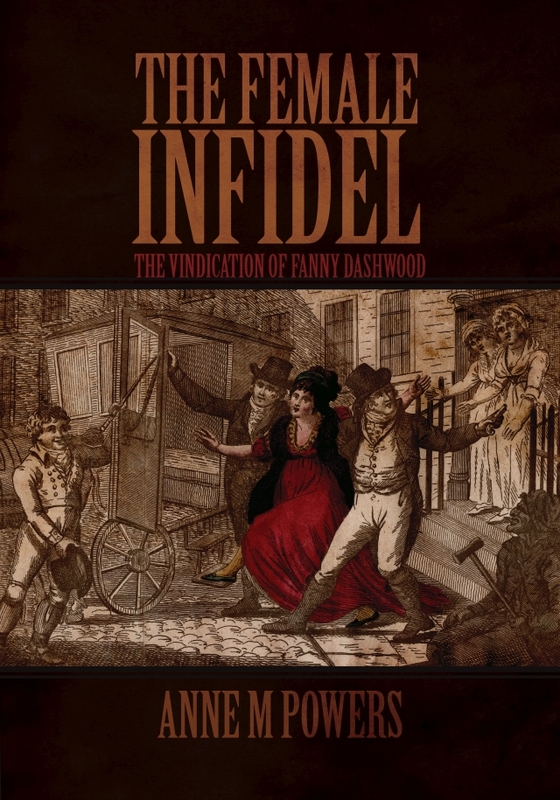 This little book, which is a gripping and horrifying read, was republished in 2014 by Dover publications, unabridged from the original edition of 1838. It is also available as an ebook from Dover and other sources. Williams, James. (2015) A Narrative of Events: Since the 1st of August, 1834, by James Williams, an Apprenticed Laborer in Jamaica. Mineola, New York: Dover Publications Inc. I owe a debt to Michael Hardy who kindly obtained this much better copy of the image of Robert Cooper Lee from the Christie’s sale catalogue of 27 March 1979. When I call this a ‘lost’ miniature I am sure the owner knows they have it! and I hope they still know who it is – too often miniatures end up being described simply as ‘portrait of an unknown man’ (or woman). 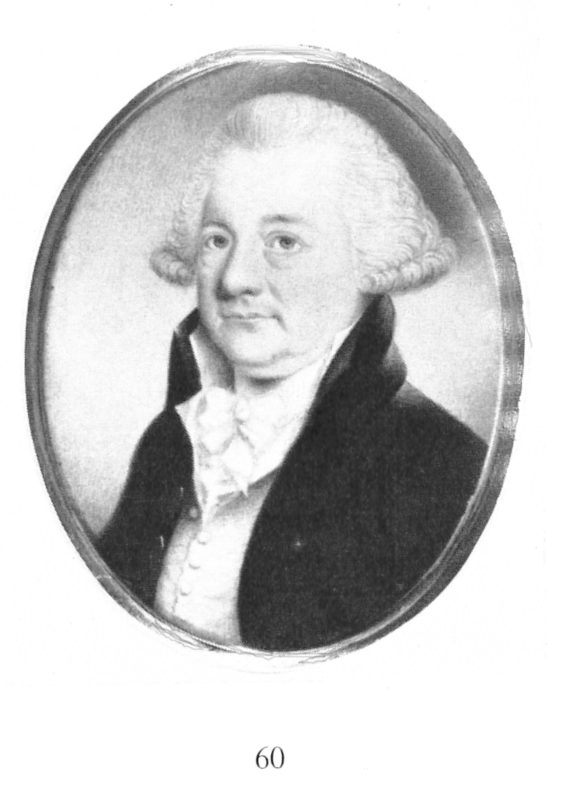 Robert (1735-1794), son of Joseph and Frances Lee, married Priscilla, daughter of Dennis Kelly and Favell Bourke. All of which is correct except that the mother of Priscilla Kelly was not Favell Bourke. If you’d like to know more, it’s all in the book! I do wish the catalogue had said what colour his eyes were, and what colour the plaited hair was. Was it some of his own hair, or perhaps some of Priscilla’s? It would be lovely to know who now has the miniature, and whether they have any idea of the family history that goes with it. Some readers will be aware that I am currently studying for a post graduate Diploma in Genealogical, Palaeographic and Heraldic Studies with the University of Strathclyde. I am hugely enjoying the course, but one of the things I have learned is the inadequacy of the way in which, in the past, I have recorded the sources of the information for the family trees I have posted on this website. Pending being able to revise them and bring them up to an acceptable standard I have removed the links from here. Meanwhile if anyone has a specific query relating to any of the following families please feel free to get in touch and I will do my best to provide an answer. We think of crowdfunding as a modern phenomenon. When a family loses everything due to a fire in their home just before Christmas, thousands of people respond to an appeal by their friends on the internet, donating toys, clothes and money. One family were so overwhelmed by the response that they were able to donate a huge number of duplicate toys, wrongly sized clothes and excess food to local charities. For the eighteenth or nineteenth century family suffering such a disaster the prospects were potentially disastrous. 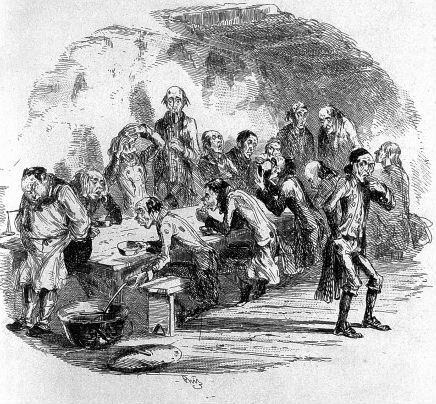 Death of a breadwinner meant that the workhouse loomed. While researching something else a few days ago in the wonderful British Newspaper Archive, I came across a sad tale, made bearable by the generosity of friends. The Public Ledger and Daily Advertiser for Monday 22 March 1819 carried an advertisement inserted by the friends of a ‘Widow and Ten Children’. Her husband had been a Captain in the West India Service, and formerly a Master in the Royal Navy. Once the Napoleonic Wars ended of course there was no further need for the large numbers of soldiers and sailors who had fought, and many became destitute. A former Naval Captain would probably have been pensioned on half pay, but as the article does not name him we cannot know if this was the case. Wanting to provide for his family this former Navy man set himself up to trade, but he suffered ‘severe losses at sea’, trade was generally depressed and he became bankrupt. He had many good friends however, and they set him up with a new ship and he began once again trading with the West Indies, hoping to repay the debts and to be able to support his wife and ten children. One of the children, a boy of six, was described in the newspaper as being ‘an idiot’, the general description at the time for any form of mental handicap. This child was said to be ‘quite incapable of taking the least care of himself’. Then disaster struck again. The captain fell ‘victim to the fever at Jamaica’ and died. Those familiar with the dangers of yellow fever, malaria, smallpox, dysentery and the like at the time will know it is a sadly familiar story. Step up Messers Godfree, Greensill, Harmer, Salter, Wilson and Wallis, all at various London addresses, who were advertised as being willing to authenticate the story and receive subscriptions on behalf of the poor widow and her children. Calling for subscriptions in this way had been facilitated by the rise of a mass market press. 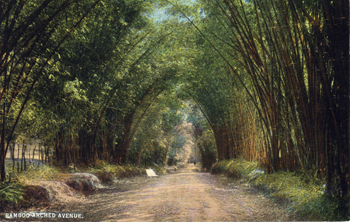 Indeed the terrible hurricanes of the 1780s that destroyed plantations and caused huge loss of life in Jamaica, and the reaction to them back in England, had spawned what was probably the first ever mass campaign for donations in the face of a natural disaster. Let us hope that the readers of the Public Ledger and Daily Advertiser were as generous as those who had responded to the hurricanes and the people who now respond to appeals on social media to help those who have suffered loss and disaster. Sadly, since the widow is not named we will never know what happened to her and her many children, but I think there is a very good chance that she and they were able to avoid Christmas Day in the workhouse. Only relatively recently have many people in Britain become aware that the presence of black and mixed race people did not begin with the arrival of the Windrush in 1948. Indeed we also forget that the ship was called the Empire Windrush reflecting a heritage that was already on the wane. Most people are still unaware of a black presence that goes back to Roman times and that increased in numbers during the eighteenth century. There are sometimes protests when a black or mixed race actor is cast in a historical drama by those who do not realise that this is an accurate portrayal of society at the time. BBC Radio 4 is currently broadcasting a series of short talks on Britain’s Black Past and this reminded me of Betty Harrison, servant of the Lee family for nearly sixty years. Had it not been for the note on a scrap of paper, shown above, I would never have known when she died or how old she was, let alone that she had married. 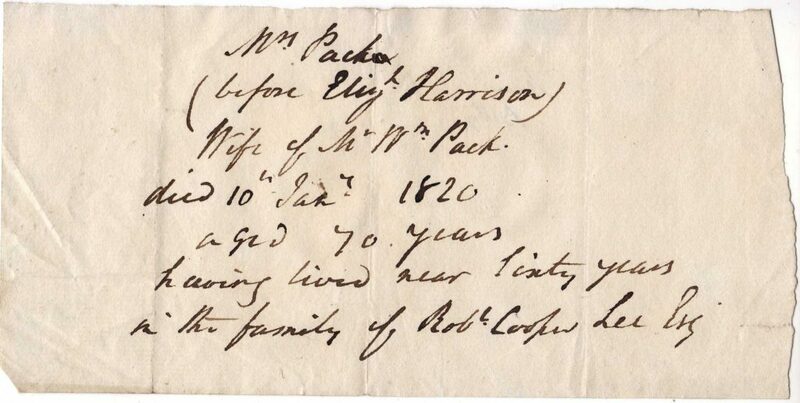 For those who have not read A Parcel of Ribbons I should explain that Betty Harrison travelled to England from Jamaica with the Lee family in 1771 and lived with them until her death in 1820. The entry for her burial at St Mary’s Barnes, alongside members of the Lee family who had been buried there since 1732, gave her age as 70 and her parish of residence as St Marylebone, but made no reference to her origins. Like many other black British residents her colour was invisible, and yet in the 1920s the family biographer Audrey Gamble referred to her as the Lee’s ‘black mammy’ and she was so much a part of the family as to merit burial with them rather than in London. Elizabeth Harrison was born in Jamaica about 1750 and must have joined the Lee family at about the age of ten, probably as nursemaid to their eldest child Frances. 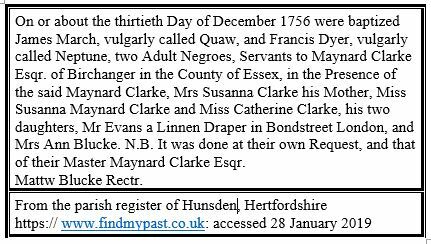 It is impossible to be certain of her birth, but there is a baptism on 13 March 1758 in the parish of St Catherine for Thomas and Elizabeth, the children of Elizabeth Harrison a mulatto woman. There is no record of whether Betty was free or enslaved, but it seems probable that she was free. The Lee children maintained an affectionate relationship with Betty all their lives, referring to her in their letters and bringing back presents for her from trips abroad. Robert Cooper Lee left her a life-time legacy of £20 a year, equivalent to an income of about £40,000 a year now (source: www.measuringworth.com). She had saved enough to be able to lend £30 to a Lee family member in 1804 so her circumstances were prosperous for a servant. After the deaths of Robert Cooper Lee and his wife Priscilla their house in Bedford Square was sold and their children all set up separate homes. Betty Harrison stayed with Frances Lee who moved to Devonshire Street in Marylebone and it was probably there that Betty died in 1820. The real mystery to me, and one I have yet to solve, is who was Mr William Pack, and when did Betty marry him? There was no mention of him in any of the Lee correspondence that I have seen and without the scrap of paper shown above (probably written by Frances Lee) I would never have known he existed. Was he also a Lee servant? Were they married in England? When and where was he born and when did he die? And was he also of African origin? To date I have found none of the answers, but as more and more records come online I hope to one day. Meanwhile a huge amount of work is now being done on the British people whose African origins have so far been invisible. You can read about Black British History Month here and if you are in London you can visit Black Chronicles: Photographic Portraits 1862-1948. There are also many regional events taking place helping to raise awareness of history that should be better known.